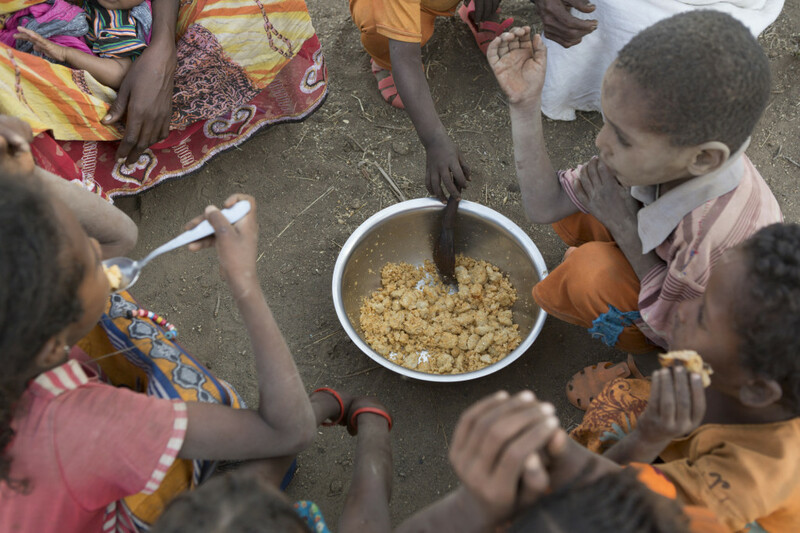 The food crisis in Ethiopia is starting to hit children hard. ChildFund is working to help identify children like Fentale who may be in danger from malnourishment. 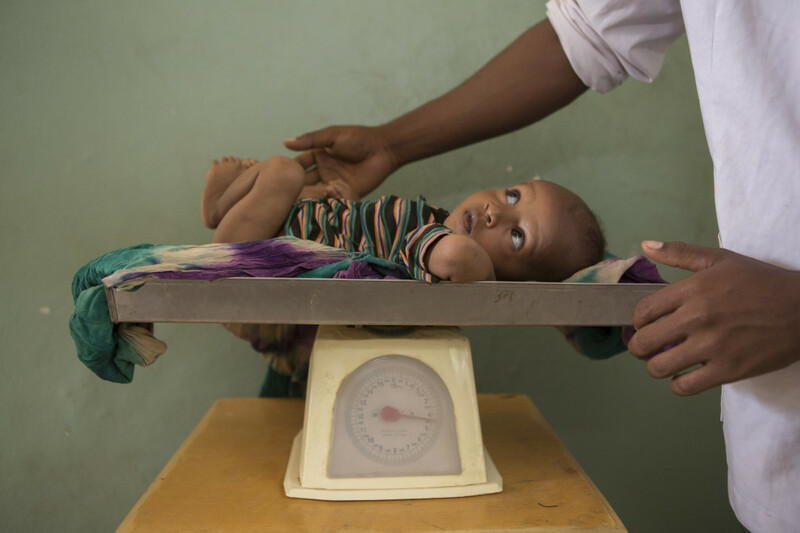 Here Fentale’s mother Halko explains how the drought has affected her family..
Three-month-old Fentale is weighed during a malnutrition screening at a ChildFund sponsored health center in the Fentale District of Ethiopia. Halko, 28, is the mother of 3-month-old Fentale, who is suffering from severe acute malnutrition, a condition that can lead to brain damage and death. A two-year drought in Ethiopia has caused a serious food shortage leaving millions without enough to eat. Halko, who is married and has three more children, eats only a diet of maize flour and is unable to produce enough milk to feed Fentale. After a health extension officer from the government of Ethiopia identified the possibility of severe malnutrition, Halko took the baby to a health post in their village, where a health worker referred them to a health center. Halko spoke to us recently about the drought and the food shortage affecting her family. Due to the absence of rain, the conditions here are so hot and dry. It’s difficult to live in this village. The trees give no shade. The drought is really affecting us. It started two years ago. There’s been no change. It is the same. If the rain comes, the situation will be different. We are facing a problem. The livestock are not able to produce milk. If the livestock can’t give milk and I can’t add milk to our porridge, then we face problems. We eat only maize porridge without milk. Our livestock have no pastures to graze because there’s been no rain. They don’t have grass to eat. Because of this drought, we have a food crisis. Our children also suffer because of the drought. They don’t get any curd or milk. In the past, we’d add different things like onions or rice – and we may have gotten tomato or oil sometimes. Now we eat only maize. We can’t even get oil to cook with. The land is dry and it produces no crops. There’s been two years of no rain, and we haven’t been able to harvest crops. We planted maize and white teff [an important food grain used to make staple food injera], but since there was no moisture, the seeds did not germinate. During normal times, we used to buy cabbage and potatoes from the market, and we cooked it together with the maize, but there’s no more now. The distance to the water point is two hours from here, one way. If we go in the morning, we return back here by noon. My, how we travel. 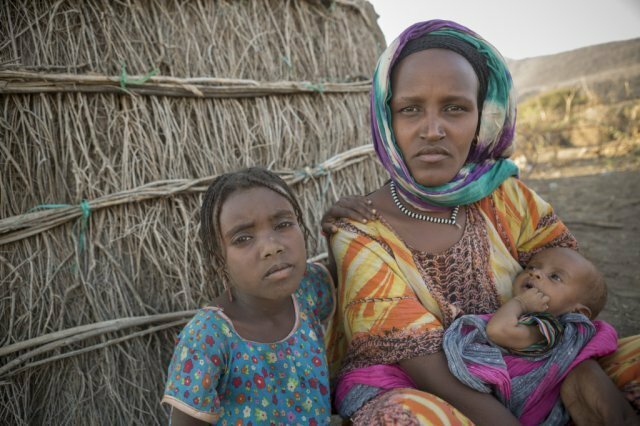 Halko, 28, sits outside her home with her daughter Meti, 7 and her three-month-old son Fentale, who has been diagnosed with Severe Acute Malnutrition. Fentale is 3 months old. We took him to the health center, and they measured him. They told me yesterday he will be admitted and treated there, and I have to stay there with him. It started after he was born; now he’s 3 months old. There’s been no improvement or growth, and he cries the whole night. If he’s not able to get milk, he cries all night. He cries and kicks all night. He started coughing after he was born. After coughing, he would cry all day. Especially in the hot weather, he’d cough and cough. If I’m able to give him some milk, he’s better. If he gets some milk, he’ll sleep. But if he can’t get milk from my breast, he won’t sleep and will just cry. When he first started crying, we took him to the health center. They identified his problem and advised me to eat different foods, not just maize, and to drink enough pure water. They said to try to breastfeed him more often. I fear for the future. I don’t know whether Fentale will pass through this situation. We are hoping he’ll recover his health and grow to be a man. We don’t know if this will happen, and he’s not able to speak and tell us his problem. The whole night I sit with him, and this week is somewhat better. What we need right now is teff. Wheat is not good. Maize doesn’t really have any benefits. A balanced diet is important for my family. For their physical well-being, they need pure water and milk too. If God gives us rain, we will try to plant crops. If our child recovers, I will be thankful. We need food. That’s our most serious problem. YOUR SUPPORT IS URGENTLY NEEDED TO HELP PROVIDE ASSISTANCE TO THOSE CHILDREN AND THEIR FAMILIES MOST AT RISK. PLEASE DO WHAT YOU CAN TO HELP BY DONATING NOW. YOU CAN MAKE A PAYMENT ON LINE USING A CREDIT OR DEBIT CARD HERE. Alternatively you can phone us at 1800 22 10 10 (Freephone) or 01 6762128 to arrange a donation. Postal donations should be marked ‘Ethiopia Food Crisis Appeal’ and sent to ChildFund Ireland, 22 Windsor Place, Dublin 2.